Many religions out there today make prayer so complicated. Some have pre-scripted chants, some require you to do or say things and repeat them over and over. Some prayers require you to be in a certain place, doing a specific action a few times a day. Prayer actually can be simple, yet how do so many people get it wrong? Even today, if you’re not praying on your knees, it makes you feel like your prayer is not good enough. If you don’t get up at 5 in the morning to pray every day, some preachers make you feel like your prayer life isn’t that great. What if I told you that you actually don’t need to be in a certain place or a certain time to pray? What if your whole day revolved around prayer? I’ve had this liberating feeling lately that prayer could be done anywhere, at anytime. God listens to your prayer. God WANTS to be part of your day. He doesn’t require you to actually do anything, just talk, continually. But how is this possible? Well, this is the power of a simple prayer. Here’s a simple version highlighted by Jesus. This is a simple prayer that Jesus taught. Nothing else, nothing more. That’s it. Jesus didn’t say, “Well you must first be showered, then you go into a dark room, and you kneel down on your knees. Make sure you have tissues, and make sure you don’t eat before praying.” He simply modeled how to pray, but we try to complicate it by adding so many other religious requirements that make it nearly impossible to do it continually. (1 Thessalonians 5:17 says “Never stop praying.”) So you see. You have to pray, continually. Never stop. It is about communicating, daily, every hour, every minute. How do you do that? With a simple prayer. If you’re looking to deepen your walk with God, wanting to pray more, or perhaps you’re just wanting to learn HOW to pray, this is a great book to get. Max Lucado takes the model that Jesus gave in Luke 11 2-4 and he explains that prayer is very important, yet it can be very simply integrated into our whole entire day. 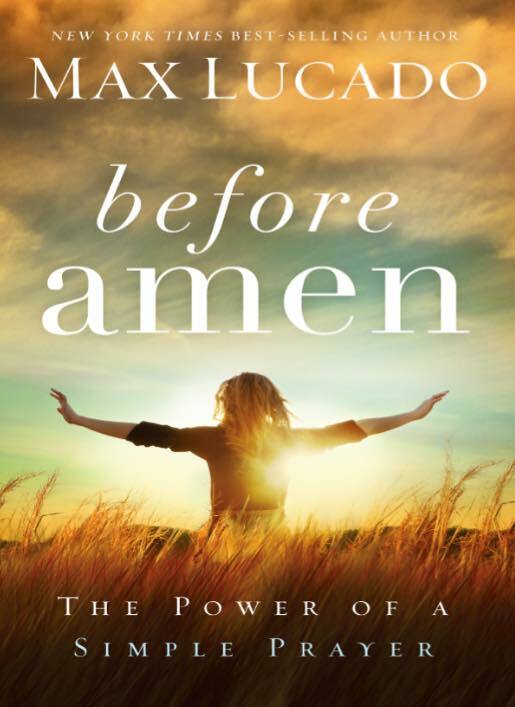 In his book, Before Amen, he highlights the importance of being thankful. He says that gratitude was the first sin and many today fall into the trap of ingratitude. If we just learned to be thankful all throughout the day, for the little things, it would be a different world. In his book, he also says that we must focus on God’s goodness. I need help. Heal me and forgive me.